I want to share one of the most fun, excessive, over-the-top meals I’ve recently had with you all. On the northern edge of the East Village on 1st Ave. at 13th St. there’s a cool, newish place called Jeepney. You won’t be able to miss the gigantic, bold, yellow signage. Jeepney is a self-described Filipino gastropub that serves hearty Filipino specialties alongside Southeast Asian inflected cocktails. 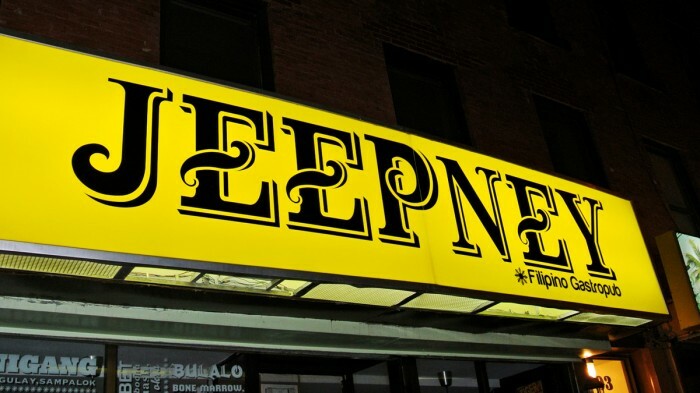 Jeepney is owned by the Maharlika guys and has the same hip, cool vibe as the sit-down spot. 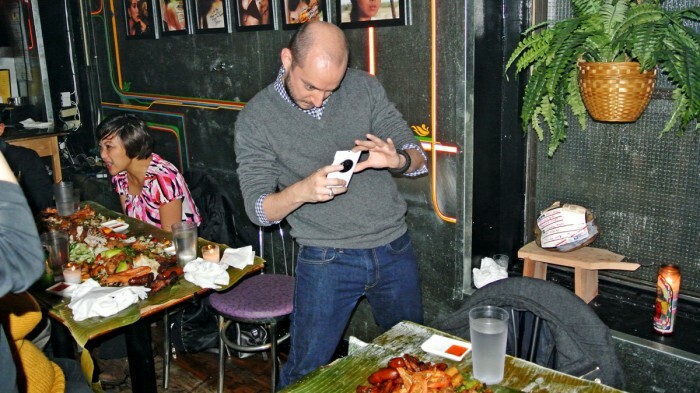 I’ve gotta warn you though, the hip decor at Jeepney isn’t exactly Safe For Work. On this particular Thursday evening, Amy and I were accompanied to dinner by two of my close friends from Foodspotting, Meng and Dr. Klein. We had all heard great things about a special feast at Jeepney served every Thursday (and has subsequently expanded into Wednesdays too) by reservation only called Kamayan (kuh-MY-uhn) Night. We were all very excited to check it out. Before arriving that night, I had no idea what I was getting myself into except that there was going to be a massive amount of Filipino food that we would be eating it with our hands! Unbeknownst to me, Dr. Klein had preselected the dishes we’d be having as a part of our Kamayan meal when he made the reservation. So, as soon as we were seated at our table, our feast was already laid out in front of us. 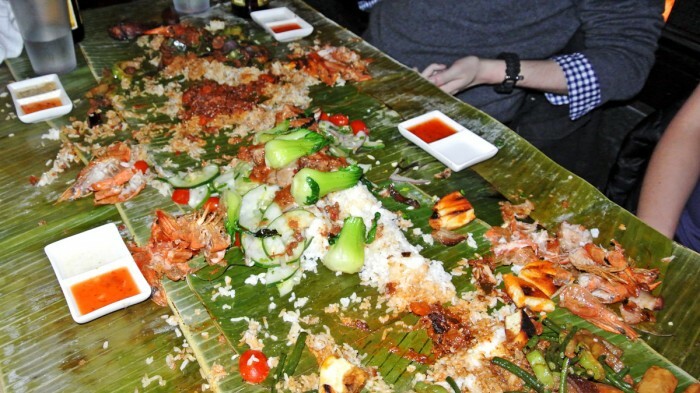 The table was completely covered in banana leaves with mounds of coconut rice and garlic rice topped with a variety of Filipino dishes ready for us to attack. We Foodspotting obsessives quickly conducted our requisite food photo shoot of the spread before diving in. I cannot emphasize enough how ridiculously massive the array of food was. Keep in mind, this entire table was served to only four of us! It was so long and spread out that I needed to take a panorama to do it justice. Both halves of the table were stocked with the same dishes, just mirrored in arrangement – even better for photographic purposes if you ask me. I’ll just go ahead and tell you about everything we ate starting with the crispy lumpiang shanghai spring rolls, tender pork chops, and longganisa sausage at the ends of the kamayan table and working my way across. The Lumpiang Shanghai were deep fried and had a crunchy rice paper exterior that surrounded a moist beef, pork, carrot, waterchestnut, and xiao xing (rice wine) filling. These were very nicely executed springs rolls, simple but very tasty. The Pork Chops were meaty, tender, and had a delicious sweet glaze coating their exterior, but was definitely one of the mildest dishes we were served. The dish was pleasant, but the others were certainly more exciting. The Longganisa, however, was one of the most interesting, bold, flavorful, moist, meaty, garlicky, spice-loaded sausages I’d ever had. I’d definitely return to Jeepney for more of this incredible sausage on its own. The next dish in line was the Prawn Adobo. These massive shellfish were served head-on with plenty of tender seafood meat underneath the shell with a deep, flavorful, sticky brown adobo sauce on top. Yes, of course after pulling the prawn heads off we sucked all of the flavorful juices out. That is of course the best part of head-on prawns. Next, we arrive at the Pinakbet, a Filipino dish that I’m quite fond of that was loaded with roasted kabocha squash, sautéed eggplant, steamed long beans, bitter melon, pork belly, chicharrón, and bagoong broth. This wintery stew was a lot like a thickened Thai curry with a ton of meaty, fatty, tender pork belly, but with distinctively Filipino flavors like bagoong, a condiment made of fermented shrimp, fish, and salt. Next up was the Lamb Menudo which was encircled with triangles of Filipino bread called Puto. The bread was like a really thick, fluffy pita, which worked well for scooping up large bites of the rich, flavorful, shredded lamb curry. There was definitely offal-flavor coming through in the profile of this meaty lamb curry, liver, I think. I really enjoyed the subtleties and complexities of the flavors in this dish and appreciated the funky punch of liver. This was probably the best dish of the night. Last but certainly not least, right in the middle of the table was the Bicol Express, another curry-like dish. This one was loaded with slow roasted pork shoulder in coconut milk, sili (wild hot chile) and bagoong sauce, vegan longganisa, pickled chiles, and baby bok choy and had a much creamier, coconut-focused flavor than the lamb menudo that preceded it. Once again, a hearty, flavorful, meaty, filling dish that was extraordinarily satisfying and enjoyable. I think the Lamb Menudo and Longganisa Sausage were my favorite dishes, but really everything was incredible. It was a ton of food, but I think we put a good dent into it. Eating all of these dishes with our hands was definitely a messy experience, though. I never thought I’d attempt eating loose grains of rice or curries with my hands, but somehow it worked and I had a ton of fun in the process. But, we’re not done yet! Even though all four of us had pretty much eaten ourselves into a coma, we still had dessert on the way. An enormous bowl of a dish called Halo-Halo, which means Mix-Mix in Tagalog, arrived soon after the kamayan table was cleaned up and taken away. 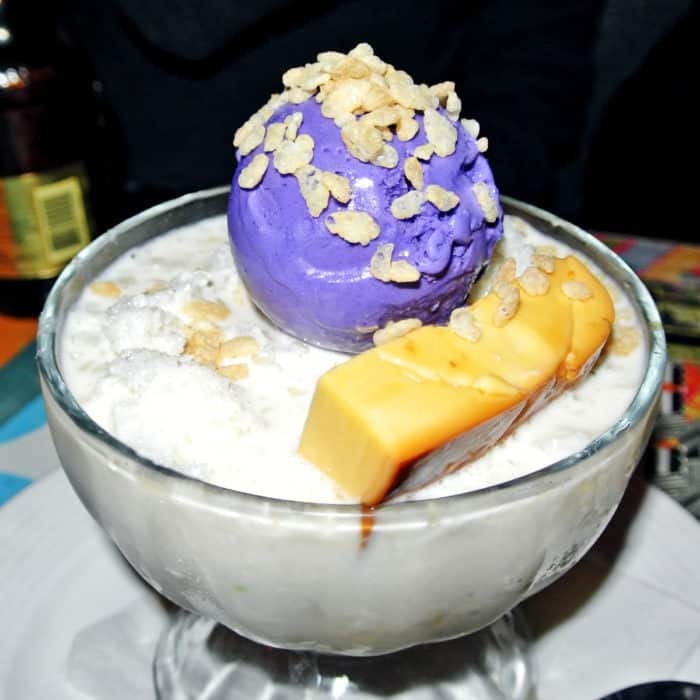 Halo-Halo is a very unusual dish with many ingredients you don’t normally find in desserts. It’s made with shaved ice, coconut milk, coconut gelatin, candied fruit, beans, flan, rice crispies, and an absolutely amazing, bright purple ube ice cream. It was a totally strange dish with bizarre flavor combinations and textures, but it was also just what we needed after the extremely hearty and savory kamayan main course. 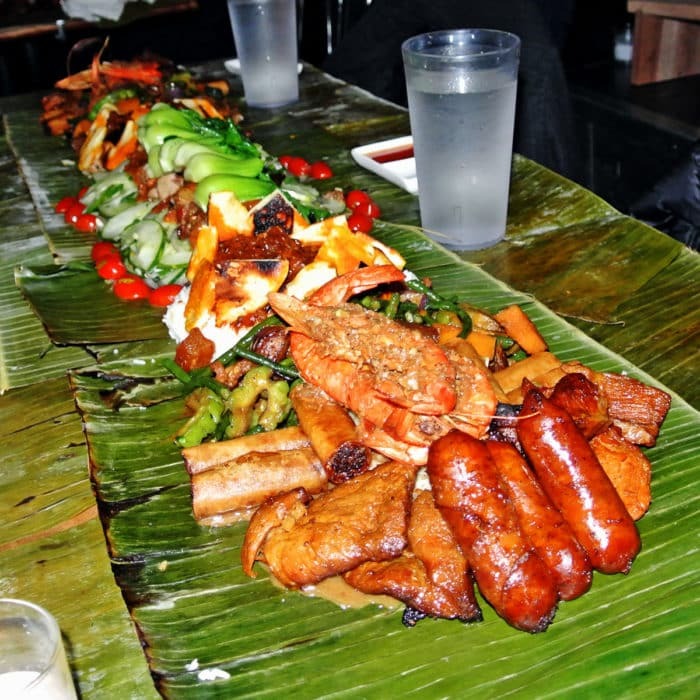 Even if the food wasn’t absolutely delicious, I’d still recommend going to Jeepney for Kamayan Night to experience the joys of eating Filipino food with your hands. 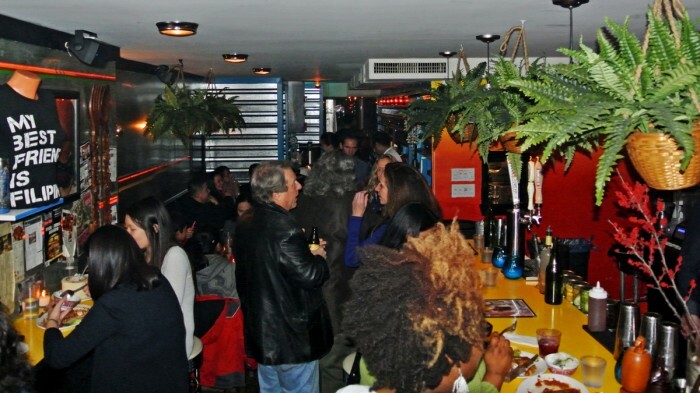 Luckily, not only is it a ton of fun, but the food is interesting, flavorful, outstanding, and filling as well. This meal might push you a little outside of your comfort zone, but just go with it. Trust me, you’re gonna love it. Know of any other strange eating experiences around New York? Let me know in the comments below. I’m ready to go back after reading this! Thanks so much for reading and the social sharing today, I can’t wait for my next visit!